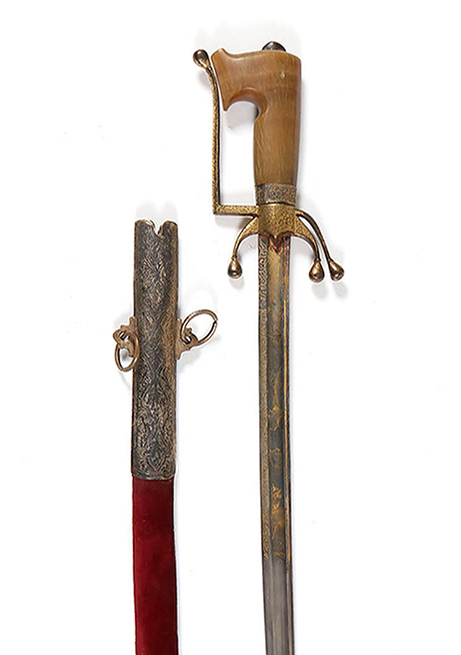 Nimcha sword, north Africa, 19th century, sold Online for SEK 9,500. All lots are sold in their present condition, shown before the auction. The ultimate responsibility rests with the customer, to before the auction, ascertain the objects' quality, authenticity and condition. The auction house is not liable for wear, damage, defects etc. which have not been reported. Clocks, watches, technical objects and instruments are sold as works of art, wherefore no guarantee of their technical function can be provided. The liability of Skånes Auktionsverk is always limited to the price including commission that the buyer has paid for the item. Skånes Auktionsverk is thus not responsible for other damages and expenses that may have affected the purchaser. The auction house accepts no responsibility for bids submitted but not registered, regardless of whether the failure to register is a result of technical errors, negligence or otherwise. Skånes Auktionsverk’s responsibility for the care and supervision of purchased lots ceases if they are not claimed within the prescribed period. To bid on the auction, you must be a registered client. A customer account is obtained through customer service or our website. We register your name, address, telephone number and e-mail. We also require a scanned copy of your passport or other identification. After your customer registration has been approved you receive a customer number by which you identify yourself when bidding as well as in your other contacts with Skånes Auktionsverk. Whoever gives the highest bid is the buyer, and the price is the hammer price. Any person who bids on behalf of others is responsible for the purchase being completed. In case of equal final bids, the lot goes to the one who first submitted the winning bid. Bidding can be made online through our website www.skanesauktionsverk.se. After logging in, customers can bid until the end time which is specified on each item. If the bid is received when less than 2 minutes remain until the object's end time, countdown restarts automatically with 2 minutes remaining until the new end time. After each bid the bidder is informed whether the bid is the highest or not enough. Every bid is valid and cannot be withdrawn afterwards. Written absentee bids are accepted at customer service in the showroom until one hour before the first auction is ended. Skånes Auktionsverk treats every submitted bid in confidence. The bidding is done automatically, and as favourably as possible for the purchaser. The auction house is not liable for any loss that may affect the customer if the auction house fails to implement a bid. Directly after the auction an invoice is sent via e-mail. If the buyer’s contact information is incorrect, or if the buyer has no e-mail, it is incumbent on the buyer to ask whether his or her bid has resulted in a purchase. To the hammer price is added a 22.5% commission fee including VAT, and a fee of SEK 30/lot including VAT. Payment can be made directly after the auction as soon as the invoice is received, and in any case payment must be received no later than 6 days after the auction date. If payment is not made within 6 days of the auction an interest fee with the discount rate of 8% may be added. If the purchase price and interest are not paid within 6 days of Skånes Auktionsverk sending demands to the buyers, the auction house has the right to cancel the purchase and selling the object at a new auction. Any loss is paid by the buyer. If the buyer has credit from another sale at Skånes Auktionsverk, the auction house is entitled to deduct any such loss from the credit. If the buyer has submitted other items for sale, Skånes Auktionsverk is entitled to sell these items at Skånes Auktionsverk without being bound to the purchaser's fixed reserve price. The buyer is not entitled to demand the extradition of items submitted to the auction, as long as the overdue debt to Skånes Auktionsverk is not paid, regardless if the value of these items is considered to exceed the overdue debt. Skånes Auktionsverk is entitled to reject bids submitted by a buyer who has mismanaged their previous payment obligations to Skånes Auktionsverk, or bids delivered by another person on his or her behalf, likewise Skånes Auktionsverk is entitled to demand a deposit as a condition to accept future bids. The purchase price must be paid before the purchased lots may be extracted by the buyer. Failing to pick up within the 6 day limit, the lots will be moved for storage at the buyer's expense and risk. A storage charge of SEK 25/lot and weeks to come. Purchased items which are paid but not collected, Skånes Auktionsverk is authorized to sell in accordance with the law of the trader’s right to sell non collected objects (1985: 982). If the buyer is unable to personally collect purchased items, a transport can be booked via a transport company, see for example www.skanesauktionsverk.se/transports. It is for the buyer to arrange for the transportation of auctioned goods without delay. Purchased items will be disclosed as soon as they are paid for. According to the Swedish Copyright Act (1960: 729) a resale right, or droit de suite, fee is charged on the sale of works of art and applied art of Swedish and certain international artists. The fee is 5% on the hammer price and goes to the artist or his/her surviving until the end of the seventieth year after the artist's death. Auction items covered by the fee are marked in the catalog. On lots where the selling price does not exceed 5% of the base amount, i.e. currently SEK 2325, no fee is charged. According to the Act (1998: 950), the Heritage license is required for exports of certain items stated in the Act of Swedish and foreign cultural goods. For more information, see the Swedish National Heritage Board’s webpage www.raa.se/in-english. All items are sold in the condition they are at the moment of sale, according to the description in the catalog or on the website including later published changes. Changes in the catalog can be published until the item is sold. Crucial changes will be conveyed to the highest bidder by e-mail. The description is made in good faith and according to established cataloging principles. The objects can by age or specificity be faulty, have flaws or restorations that are not necessarily stated in the catalog or on the website. Images in the catalog or on the website are only for identification purposes and may not be used for the evaluation of the object’s condition. Anyone who wishes to bid at the auction should him/herself examine the items, at the pre-auction held viewings or by condition reports, to ascertain the condition of the desired lots. The description is according to the prevailing opinion of experts and appraisers at the time of sale. Would there after the purchase arise any doubts about the authenticity of the item, or consistency with the description, this should promptly be notified to Skånes Auktionsverk. In case the purchased item is a forgery, or if the description has included significant errors, which resulted in a significantly higher final price than a correct description is assumed to have resulted in, the buyer has the right to make a complaint. The total sum of the purchase can then be reclaimed. Dimensions and weights are approximate and can only be the basis of a complaint if the differences are significantly decisive for the item price. The right to complain about the purchase, during the cited conditions to cancel a purchase, can be exercised only by the person who purchased the current object from Skånes Auktionsverk. Complaints must be communicated to Skånes Auktionsverk without delay, however no later than 2 years after the date of purchase. The object must be within the same time returned in the same condition as it was at the time of the auction. The buyer can in case of a cancellation not require payment of interest on the purchase price and is not entitled to claim other expenses or losses, for example, any lost profits from the resale. A purchase cannot be claimed under the above provisions in the event: a. the description in the catalog or on the website on the day of the sale was in agreement with, on this point, the current perception among appraisers and experts. b. that, at the time of sale, the only way to determine that the object was a forgery was through the implementation of scientific processes, the validity first became known after the date of sale or whether it had demanded unrealistic costs or been unfeasible without the current object had been damaged. Skånes Auktionsverk undertakes, when possible, to make a more detailed description of the condition of an item. This is a service for customers who do not have the opportunity to examine the items on display. It is emphasized that the given information can only be used as the basis for claims when in writing. For this purpose reference is made to the description of the item. According to the law on distance contracts and purchases off premises (2005: 59), a consumer has a right of withdrawal for purchases at online auctions. The buyer, however, has no right of withdrawal if the buyer is a trader (a person who is acting for purposes relating to their own business activities) or if exemption from the withdrawal of the said Act is applicable. The buyer shall notify Skånes Auktionsverk of his/her use of the right of withdrawal within a period of 14 days commencing from the day the buyer receives the item in their own or through counsel’s possession, but not later than 25 days after the auction date. In order to cancel a purchase, the buyer shall notify Skånes Auktionsverk writing the object's lot number, his/her customer number, name and bank account, by e-mail to retur@skanesauktionsverk.se. After this the buyer shall at his/her own expense within 14 days return the object to Skånes Auktionsverk premises at Ringvägen 48 in Landskrona. It is for the buyer to package the object in such a way that it is not damaged during transport. The item should be returned in the same condition as it was at the time it left Skånes Auktionsverk’s premises. Skånes Auktionsverk has no obligation to accept withdrawal for items which have been damaged during transport or after the buyer's handling of the item during the withdrawal period. Skånes Auktionsverk will refund the hammer price plus purchase fees to the buyer, which occurs within 14 days after the object has been returned to Skånes Auktionsverk. The buyer bears all the costs associated with the transport and return. Skånes Auktionsverk may not be responsible for returning the items sent back where the buyer has not fulfilled the requirements for withdrawal. According to the above mentioned law Skånes Auktionsverk has the right to derogate from the right of withdrawal concerning objects of gold, silver or platinum, as they "refer to a product or service whose price depends on fluctuations in the market outside the trader's control, which may occur during the withdrawal period" (11§2). Exception can also be made from the sale of objects where not all individual parts included in the lot can be clearly identified from the object images, such as stamp albums and collections of coins, since it concerns a product which by its nature is such that it after delivery can be confused with other goods and that the goods cannot be separated from each other (see 11§2). This does not apply if the goods are picked up by the buyer personally at Skåne Auktionsverk and the buyer at the moment of collection invokes his/her right of withdrawal. If Skånes Auktionsverk has reason to suspect that the buyer is abusing the right of withdrawal, such as using the right of withdrawal to avoid standing by bids and thus affecting the bidding process, Skånes Auktionsverk reserves the right to close the customer's account. A list of the final prices achieved at the auction can be viewed on our website shortly after the auction. Buyers can see their purchases, after logging in at our website with a personal code provided by Customer Support. Disputes concerning these terms and conditions are determined in accordance with Swedish law in a Swedish court.